I was running ahead of schedule for my service appointment so I drove past my exit, got off the freeway 8 miles later and took some twisty back roads instead, just for the fun of it. For most of the drive all I needed was 3rd gear which worked out nicely, keeping the engine in a nice meaty part of the powerband. 1) Surprising number of manuals, including a Mazda3 Grand Touring and a Mazda6 Touring. 2) Seven Miatas - 5 RF and two Grand Touring. No Sport or Club Sport models. Zero automatics. Is there a preponderance of RF models because they’re that popular or is it because of snow here in the Midwest? Or did they just sell out of the cheaper and better ones? 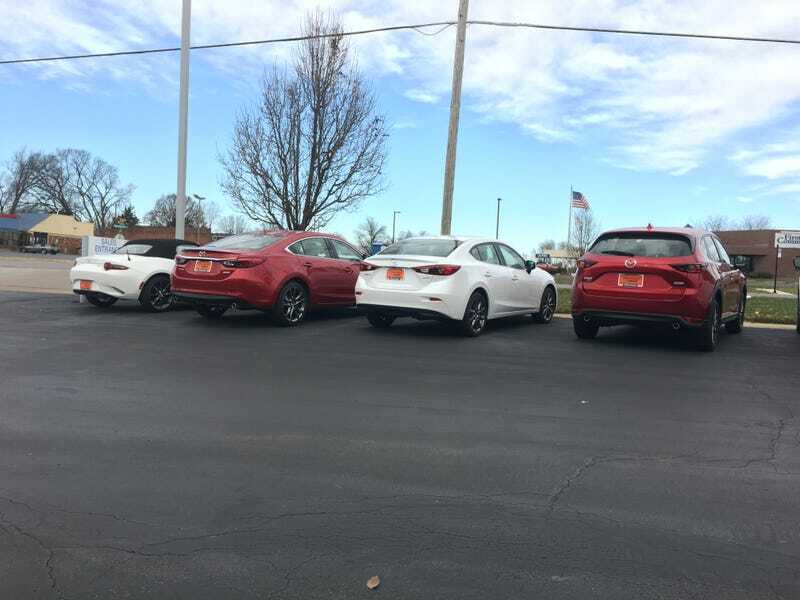 3) I liked this dealer for the no markup BS (other than ‘documentation fees’), but they’ve succumbed to the paint and fabric protection BS on every car. When I bought mine all that stuff was standard, which was OK because I seriously doubt that it’s really there (as evidenced by the water stains on the rear seat from leaving the window cracked open during a massive downpour) or if it is, whether it’s worth anywhere remotely near what they’re asking for it. And $400 for window tinting on the RF in the showroom; 5+ years ago they wanted $400 for window tinting on a Mazda5 which has a hell of a lot more windows. 4) No 2018 Mazda6s in stock and no brochure either. I’d like to see the changes, especially to the interior, as well as finding out if the turbo is front or all wheel drive. The salesman wasn’t even aware that you couldn’t get a manual on the current 6 GT, so I didn’t have high hopes that he’d know this. Oh, and apparently you can now get a 6 Touring with manual and a sunroof; a few years ago a friend was looking at a 6 manual but bought a Volvo instead when she couldn’t get the manual/sunroof combo.